Due to various challenges, Debbie Stier’s son Ethan did not have excellent marks. When Debbie, a single mom, realized she could not afford college tuition, she decided Ethan would need to do well on the SAT. 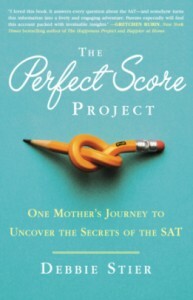 Rather than add to his stress by pressuring him, she decided to model to her son how to get a perfect score on the SAT. Thus was born The Perfect Score Project, in which Debbie tried all sorts of test prep ideas and took the SAT seven times in one year. In the process she learned a lot about parenting as well as the SAT. In terms of parenting, she learned that parents and kids who do projects together have a better relationship and that the kids, including teens, benefit in many ways from such focused time with their parents. She also learned that pushing her own projects could backfire, but getting into her teens’ space in a friendly way, as Gordon Neufeld has written about, was important. Although a mom can express love through baking cookies, through helping a teen learn, and in many other ways, a distracted parent leads to a distracted teen. All these ideas and more made Debbie realize that, for her, the SAT project had actually been a course in remedial parenting. Cramming is not nearly as effective as spacing one’s studying out. US students excel in self-confidence but not in performance. Handwriting is related to learning, so write out the things you need to learn. Debbie describes how the amazing and expensive Advantage program uses notebooking, something many homeschoolers love. The SAT essay score is directly correlated to essay length and vocabulary level. If you want to learn something well, it helps to love it. Because deliberate practice is the key to excellence in all spheres of life, as Malcolm Gladwell pointed out, it is a good idea to take practice tests frequently. One must cultivate the ability to focus under stress. And, most importantly, all the tricks and techniques in the world will not help much if you don’t have a solid foundation in the subject matter: reading, writing, thinking, and math. Debbie also includes tables and tips for buying study books, writing the SAT essay, recognizing test anxiety, knowing what to do on test day, preparing for the math section, deciding how and when to guess, and much more. So, after devoting a year to the SAT, did Debbie get a perfect score? No. Not even after all that effort. Although she did improve significantly, the lack of a solid foundation in the subject matter really hampered her. On the other hand, her son, who had been her reason for doing this project, was motivated to study and even to do Kumon math worksheets. He did achieve the score he aimed for, and was also offered university scholarships. So that goal, the main one, was achieved. The greatest benefit to Debbie’s family was, however, completely unexpected. By working on a project for her children, one that they could follow and watch and even participate in, one that she was obviously doing for them, she developed a bond of love and respect with them. Of course, the bottom line for you is: Would it be a good idea to buy The Perfect Score Project to help your children prepare for the SAT? It could give you background information and encouragement as a parent of a SAT-bound teen. 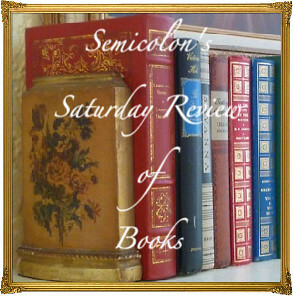 It certainly would give you some ideas about the SAT as well as about parenting and is also interesting as a memoir. Debbie writes well. For practical SAT help, though, I recommend solid and joyful learning and living throughout the years, the kind of learning that happens in many homeschools. As you can read in my review of Acing the SAT, this does lead to the best SAT scores as well as the best preparation for life. The Perfect Score Project can help a lot, but it is not necessary. Note: this book contains a few instances of inappropriate language. 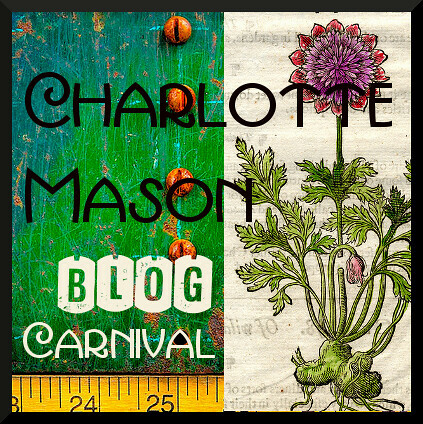 This is yet another book in the in the 2014 52 Books in 52 Weeks Challenge and is also linked to Saturday Reviews, Works for Me Wednesdays, Booknificent Thursdays, Raising Homemakers, and Trivium Tuesdays. Disclosure: A download of this book was provided by Blogging for Books for the purpose of this review. What a fascinating topic for a book =) I’m sure it was an interesting read! I don’t even want to think about when my kids are old enough for SATs! I dread the day learning has to stop being fun and become about tests. Thanks for sharing this at Booknificent Thursday on Mommynificent.com! Yes, Amy, it was interesting. Unusual, but interesting. No, Tina, I don’t think the majority of learning in a homeschool ever has to be about tests. The more fun the learning is, and the more that your kids and you enjoy it, the more learning will happen and in the long run that is what the SAT tests. Our kids do very little actual SAT prep, because their basic education is quite solid, they read widely, and have many interests. Even the most nervous and diligent of my kids has not done more than 100 hours, and the most laid back probably did under 20 hours of prep (and got perfect on two of the sections). This would probably be a good topic for another post. As a homeschool Junior in the middle of the SAT and AP craziness, this book looks like something that either I or my mother or possibly both would enjoy. Definitely going on the TBR list! There are some helpful tips in it for both students and parents, Jaina. I wish you strength and blessings throughout the test craziness! Thank you! I did wind up reading it, and I reviewed it here. It was really educational! Great! I’m hopping right over to read your review.